We are proud to have represented the Heart and Stroke Foundation of Ontario for the past thirty years. Their training is recognized both nationally and internationally. Heart and Stroke Foundation training is in demand in many fields, especially in the healthcare industry. 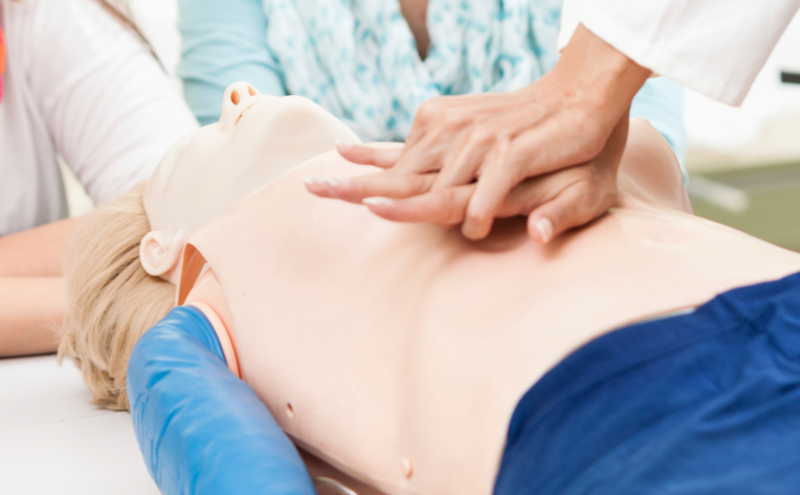 This 6 – 8 hour course includes adult CPR, child CPR and infant CPR and choking relief techniques, plus heart attack/stroke and AED use. The Healthcare provider (HCP-C) category includes all of the “C” CPR content plus bag valve mask use, two rescuer CPR, jaw thrust and other healthcare skills. This 6 – 8 hour class is designed for people in medicine, nursing and other allied healthcare professions and includes all the “C” CPR content, plus practice in two rescuer CPR, use of the bag valve mask, pulse checking and jaw thrust for spinal injuries. This 4 hour course is for those who have already taken their CPR training but are in need of renewal. The “C” level renewal includes adult/child/infant CPR and choking relief techniques plus AED use. The Healthcare provider (HCP-C) level renewal includes all the “C” content plus bag valve mask use, two rescuer CPR, jaw thrust and other healthcare skills. This course is offered on Saturdays and on weekdays. Click the appropriate button below to choose which day is most convenient for you. This course is a Healthcare Provider (HCP-C) CPR renewal class conducted under Heart and Stroke Foundation of Ontario and is specifically for Scarborough Hospital employees. The class includes adult, child and infant CPR and choking relief techniques, along with bag valve mask training, two rescuer CPR, jaw thrust and other healthcare techniques. The course is offered at two locations: Birchmont and General Hospital. This 16 hour course includes all the content of an Emergency First Aid class, plus head/spinal injuries, bone/joint injuries, heat/cold related injuries and poisons. A First Aid card in Ontario is in effect for three years – at the end of the three years, but before the expiry date on the card, you are allowed to attend a one day Standard First Aid renewal class through the agency that originally trained you. Three years after that time, you must take the full course again. This course teaches CPR and choking relief techniques for infants and children from birth to eight years of age. The course includes basic safety information and injury prevention tips. Are you interested in teaching First Aid or CPR through the Heart and Stroke Foundation? Then do check out our new course dates! !